A Sitemap is an integral part of any website. A Sitemap will help to better serve a user’s experience on your website. A Sitemap is simply a structure of a website. There are many types of Sitemaps present. Adding a Sitemap to your website will improve your website’s SEO. As we have seen earlier, a Sitemap is the structure of a website. A Sitemap of your website mydomain.com is the list of pages present on the website mydomain.com. Sitemaps are useful for both users and search engines. It will pass the information about the pages on your website to the search engines. According to sitemaps.org, a Sitemap is an easy way for webmasters to inform search engines about the pages availableon a website. The structure of different Sitemaps may vary according to the intended use. It is useful for project planning. 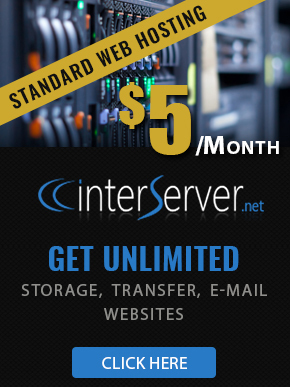 You can view the Sitemap of the InterServer website at https://www.interserver.net/sitemap.html. Let’s see the format of a Sitemap. We are going to see a simple Sitemap and it’s format. This is the format of a Sitemap. Let’s see what each line describes. The first line may be familiar to you as it specifies the file an XML file. Next line is a <urlset> tag. These opening and closing <urlset> tags are required because they indicate that the XML file is a Sitemap. All the content must be within the tags. Now inside the <urlset> tag, there are two divisions. They are the parent entry and child entry. The parent entry should start with a <url> tag and end with a </url> tag. In the same way, a child entry should start with a <loc> tag and end with a </loc> tag. After a <loc> tag, there should be a URL which should start with http://. Now, we can add other attributes. Please be aware that, the URL must not exceed the maximum value of characters, 2048 characters. The next tag is <lastmod> and </lastmod>. It tells the browser the date which the URL is modified last. The date that needs to be specified here should be in the format of “YYYY-MM-DD”. Search engines would be able to gather this details when they crawl, so it is not required to modify the field every time the document is modified. The next tag is <changefreq>. This tag informs the browsers how often the page will be changed. It will help search engines understand how often the page should be indexed. Sometimes, even if we provide the <changefreq> value, the website will not be indexed according to it. It will be depending on the indexing behaviors of the search engine. The values that can be set for this tag are: “always”, “hourly”, “daily”, “weekly”, “monthly”, “yearly” and “never”. The next tag is <priority>. This tag indicates the priority of the web page with respect to the other web pages on the same website. This value can be varied from “0.0” to “1.0”. The default priority value of a web page will be “0.5”. A web page with the higher priority value will be crawled before the page of priority value “0.5” and the web pages with lower priority will be indexed after the page with “0.5” value. Please be aware that the priority value is used to compare the web pages of your website and it is not compared with the other websites. This is the description of fields of an XML Sitemap. There are many types of Sitemap. Now we are going to see the types of Sitemap. The common types of Sitemap are listed below. A visual image will be a drawing or an image which will explain the structure of a website. There are blocks or cells used for representing the web pages. The cells will be connected with each other. These types of Sitemaps are usually used for human interaction and understanding the content locations of a web page. HTML Sitemaps may be included as an additional web page on the website. This is something different from the one that we have discussed earlier. It’s advantage is that it will help indexation of non-html content of the web site such as Images, Video, PDF, etc. This is the one we have seen earlier. This Sitemap is an XML page of the structure of web pages with the meta data of the pages. It will help search engines to index the pages effectively. This is a special type of XML Sitemap. It will help search engines to aggregate fresh newsworthy content. The main difference is that these Sitemaps include additional meta data about the news content, news source, etc. Indexing is the process of adding a webpage to the search. For example, indexing your website on Google means adding the webpages of your website to the Google search. A Sitemap has certain limitations. For example, it cannot contain more than 50 000 URLs and cannot be bigger than 10 MB. This is why if you plan to create a website with multiple subdirectories and Sitemaps, you will have to use a Sitemap Index. A Sitemap index allows you to include several Sitemap files under one file called Sitemap index. It uses almost the same syntax but instead of including your pages URLs, you will have to add the URLs to your Sitemaps. What is Accelerated Mobile Pages ( AMP )?